Easter Monday, 22 April. Annual General Meeting followed by Changes in Cawthorne, 1930’s, 1940’s and 1950’s. To be held in the Parish Room at 7.30 pm. Members £2, non-members £3, including refreshments. Would members please note that this date has changed from the one printed in your Lecture Programme. Everyone who is registered on the Electoral Register for Cawthorne is eligible to attend. Reports will be given on the work and finance of the Parish Council over the past 12 months. In addition a report will be given on the Neighbourhood Plan. If you have any concerns or matters you wish to raise with the Parish Council this is your opportunity to do so. Methodist Church - Pie and Pea Supper and Quiz Night - Ticket only event - tickets £6.00 (under 12's £3.00) Tickets availaable from Post Office, Verena, Grace or Margaret. Post Office, Village Store & Choir members. 'Easter Messy Church' - Stories, Crafts, Food & Fun - Everyone Welcome. All children must be accompanied by parent or guardian. - Don't miss it !!! - Tickets £8.00 (Under 12's £4.00) available from Post Office, Verena, Grace or Margaret. Museum Winter Lectures - Annual General Meeting followed by Ray Bull presenting "Changes in Cawthorne, 1930’s, 1940’s and 1950’s." Members £2, Non-members £3, including refreshments. Would members please note that this date has changed from the one printed in your Lecture Programme. 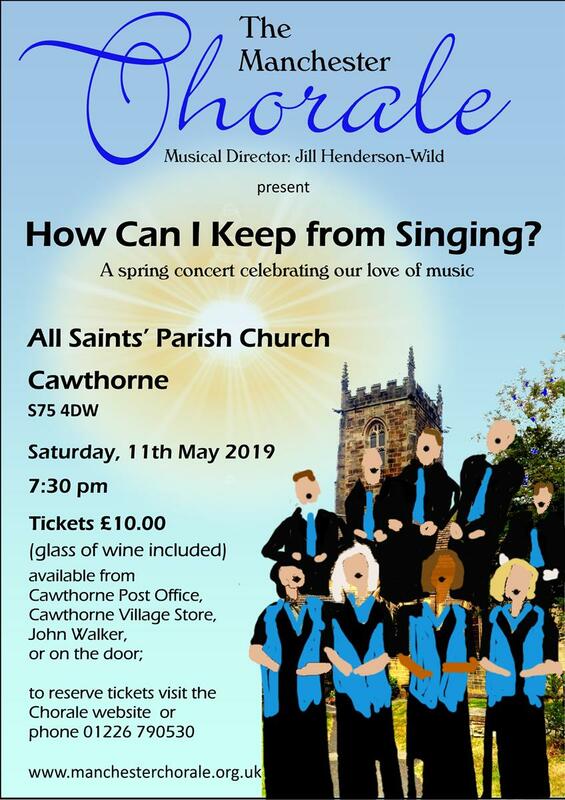 60's night, music and entertainment presented by Cawthorne Band - Tickets £7.50 available from Cawthorne Post Office or band members. Cabaret style event with a difference including Quiz, Raffle and light refreshments. Bring your own bottle. Everyone is encouraged to dress in 60's style - Prize for the best dressed. An invitation to the people of Cawthorne to come and let us know what they think of our First Draft Plan. Copies of the plan will be available to peruse and we will endeavour to answer any questions posed. Concert - How can I keep from singing? All Saints' Church - Service of Dedication of the memorial to the ten men and boys who died in the 1821 Norcroft Pit disaster. Refreshments will be served afterwards in the Church Hall. Plans are well underway for the 6th festival to include The Proclaimers, Bill Bragg and Kate Rusby plus other artists to be confirmed. Please see 'Whats On' for more information, volunteering and details of how to get tickets. This event draws people from miles around and its continued popularity has provided a substantial income to help sustain the Parish Church building. For the 2019 event we would like to include new gardens, as well as old, so if you think you would like to take part, let us know. Your garden does not have to be of showcase standard, it just has to be interesting - quirky, unusual, big or small. Just as importantly, a successful event needs plenty of volunteers, so if you feel you haven't a suitable garden, please offer to lend a hand - there will be plenty to do, with catering, parking, programme selling, assisting in the gardens, all needing willing hands. We want Open Gardens to be a real village event, as inclusive as possible, so that not only the Church will benefit, but also the many shops and organisations the village enjoys. It will be hard work but we aim to make it enjoyable so all taking part can look back on pride on a worthwhile weekend. Plants will be needed for the Garden Stall so if you are dividing perennials, weeding out plants that have seeded or sewing annuals please consider potting up some of these and caring for them until June. Plants will need to be taken to the Village Green early on 22 June or collection can be arranged in the week before the event. Alongside our leading performers we have a stellar weekend of music and arts programmed with an exciting mix of musical genres as well as a magical selection of street theatre and family arts. Don't forget, volunteers get their weekend ticket in exchange for 3 shifts over the festival weekend. To get involved and find out more visit the website www.cannon-hall.com and if you would like to take part in our Volunteering programme every Monday and Thursday contact Annice Fuller at cannonhallparkandgardens@barnsley.gov.uk or call 01226 772002. Parents' Association need help from Online Shoppers! basic needs. Everyone can help and even those with no connection to the school. Argos, Ebay, Travel companies, insurance etc. at no extra cost to you. Everyone who shops online can help.